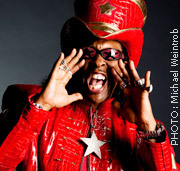 Shortly after the release of his first new album in five years, The Funk Capitol of the World on April 26th, we welcome Rock & Roll Hall Of Famer and legendary bassist Bootsy Collins to the Clive Davis Theater for an intimate conversation and bass demonstration. Known worldwide for pioneering funk music with James Brown and Parliament Funkadelic, Collins is a singularly influential bassist. His star-shaped "Space Bass" and the driving grooves he produced with it have become synonymous with modern funk and inspired everyone from The Red Hot Chili Peppers and Primus to NWA and OutKast. Aside from his seminal work with James Brown and George Clinton, Collins achieved considerable success as a frontman for several groups, including Bootsy's Rubber Band. Vice President of the GRAMMY Foundation Scott Goldman will moderate the discussion, and Collins will also take audience questions.